Awesome Games Done Quick 2018 boasts dozens of speedruns where runners make difficult games look like a cakewalk. 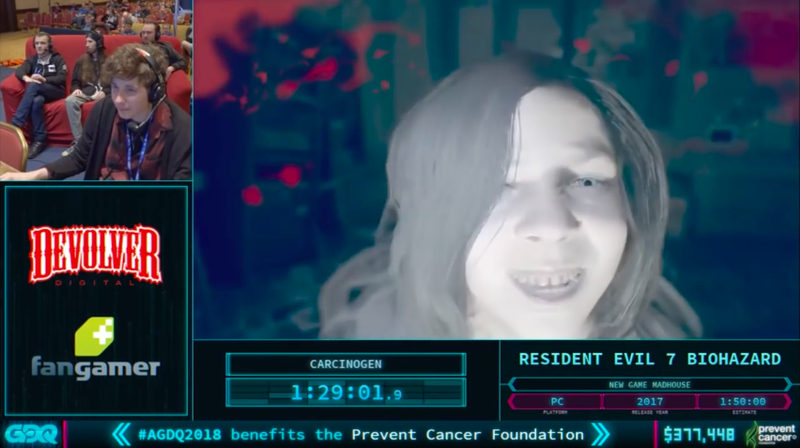 CarcinogenSDA’s Resident Evil 7 speedrun turns the game’s toughest challenge into a masterclass in improvisation as he side-steps monsters and changes his route on the fly when things go bad. Resident Evil 7 hardest difficult is Madhouse, a mode that boosts enemy damage and changes the location of key items in order to remix the main game into a frantic death-gauntlet where one misstep can spell disaster. Last night during AGDQ 2018, CarcinogenSDA completed a “Madhouse/New Game” that was an absolute joy to watch. Through mounting complications and numerous near-death experiences, he lines up perfect handgun shots and scurries to grab fresh items to bounce back from potentially devastating time losses. The most popular speedrun categories for Resident Evil 7 are New Game Plus runs where players can blast through the game using special items like a powerful buzzsaw or shoes that increase movement speed. Carcinogen’s run doesn’t use any of these items, which meant that any mistake he made needed to be balanced out by smart item acquisition. Every missed bullet or extra enemy hit altered the run, forcing Carcinogen to improvise to find the gear needed to survive. The largest complications came from unexpected enemy attacks. Carcinogen’s attempts to avoid certain monsters were stymied by “sucker punches,” a programming quirk that allows enemies to attack as soon as they spawn in. Often, he found himself one hit away from death before changing his route to pick up healing items, adding extra tension to the run and on the fly commentary about the game’s layout. 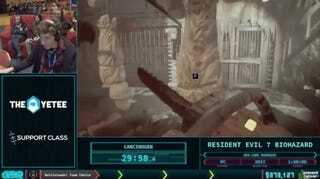 One of the most memorable moments in the speedrun happens near the end of the game. Carcinogen’s run often rushes to certain locations in order to despawn enemies and clear a path. Rushing through a derelict ship and funneled down tight corridors, he barrels into a side room in order to despawn an enemy close on this heels. Confident that the monster is gone and encouraged by his couch commentary crew, he opens the door to the hallway only to find the monster right in his face. He emits a string of panicked yelps as the audience laughs and bursts into applause. The run is bolstered by Carcinogen’s cheerful demeanor and charisma. He taunts monsters and mugs for the camera, gives out random, silly facts about the game’s Louisiana setting. These cheeky bits of trivia have a mock-nerdy affect that adds a mockumentary feels at times, eliciting laughs from the crowd as the matter of fact commentary contrasts with the violence on screen. In other instances, Carcinogen shouts out as narrowly dodges dangerous boss attacks. All the while, his three man couch commentary team helps to explain glitches and outline important game mechanics. Carcinogen completes the run with a final time of 1:49:27, capping off a spectacular performance that’s undoubtedly one of the best runs of the event.